Today I will be toasting to traveling husbands that have returned for the weekend, a great first week of school for Vance, Vaughn's first day of gymnastics class, the Tooth Fairy visiting Vance last night, and last but not least, boot shapers. 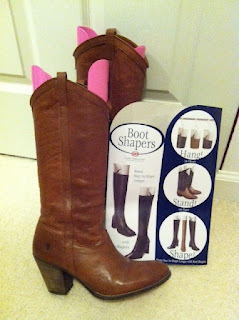 Yes, boot shapers. Have you heard of such things? I had no idea that they existed but as soon as I saw them I threw them in the cart. Perfect for slouchy boots. Kismet at Home Goods, I tell you!